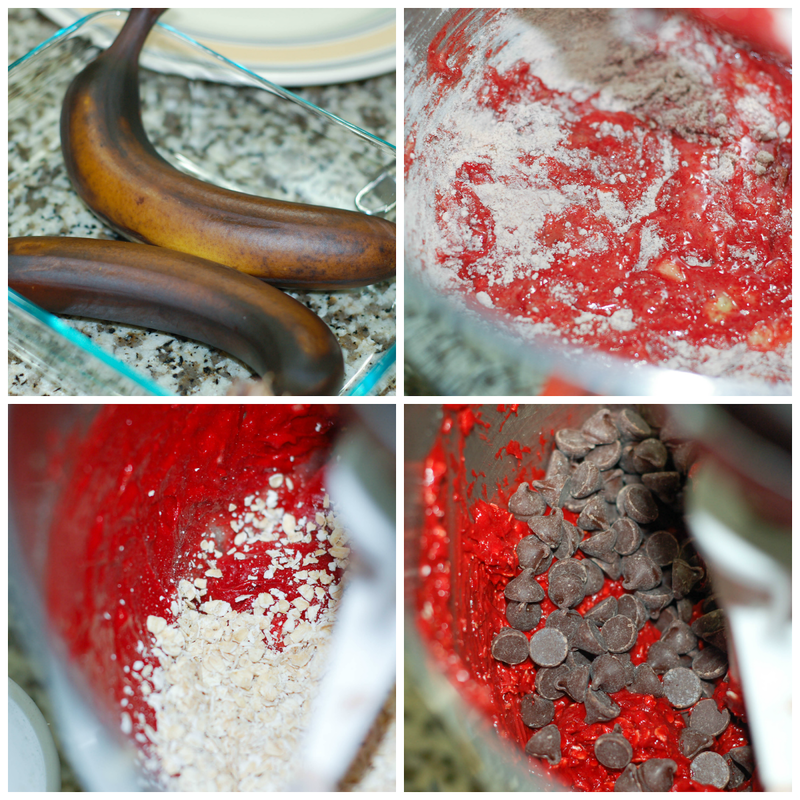 This recipe does call for ripe bananas and as you can see, mine are not there yet. However, I have learned a little trick and have been using it for awhile. Just place the bananas you need in the oven while it is warming up and watch them turn brown/black. How long it takes depends on how ripe they were to begin with. Mine took about ten minutes. I usually flip them at least once to get them brown all over. 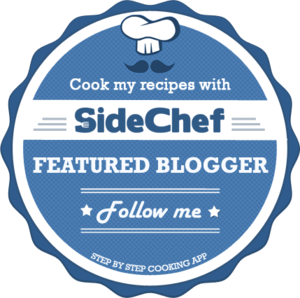 You can place them directly on the oven rack or in an oven safe dish. You will need to let them cool off a bit before slicing them open. I did make these cookies three different ways to see which I liked best. 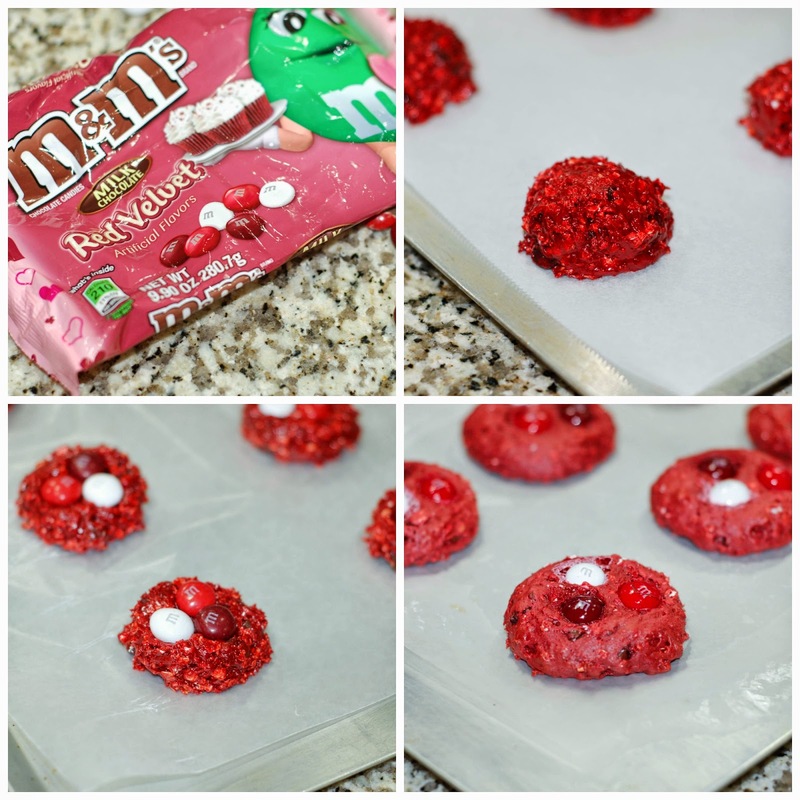 The first way was just to place scoops onto a parchment lined cookie sheet and pressed three Red Velvet M&Ms into the mounds before baking. 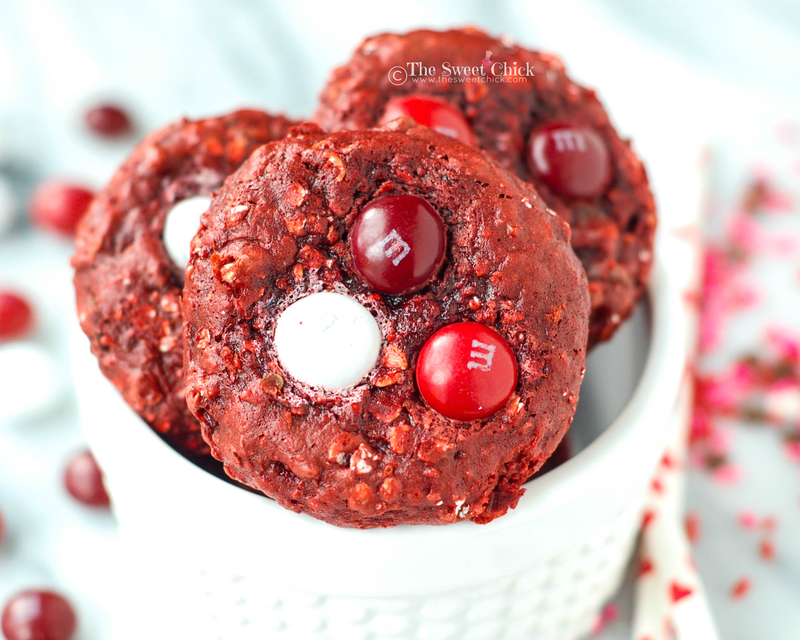 They were not very visually appealing and the colors of the M&Ms bled into the cookie, especially the white. You can try just using the red and burgundy colors if you prefer to make them this way. The easiest way to make these cookies, is to stick with the original scoop onto a cookie sheet method. It's less trouble and the cookies still come out pretty once decorated. 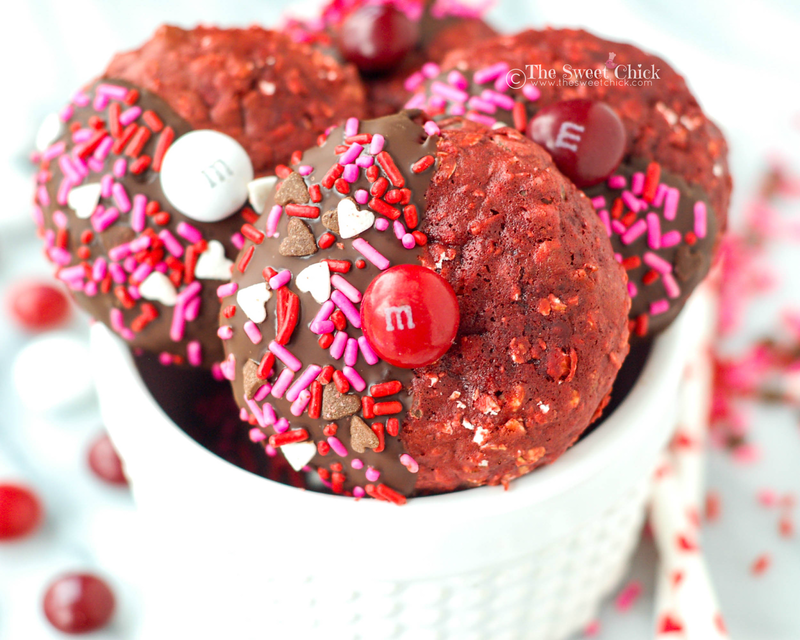 I dipped these cookies in dark chocolate, but you can use semi-sweet if you prefer. I do recommend Ghirardelli chocolate chips because they melt so beautifully in the microwave. 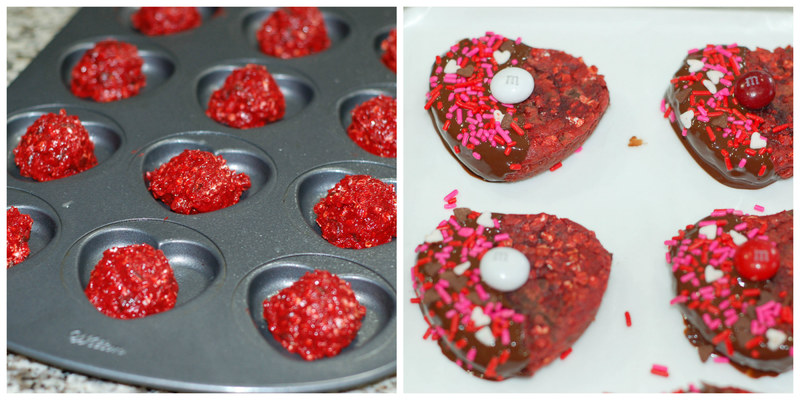 I used the same Wilton sprinkles that I had used for my Red Velvet Brownie Krispies last week. I found them at Walmart, along with the Red Velvet M&Ms. 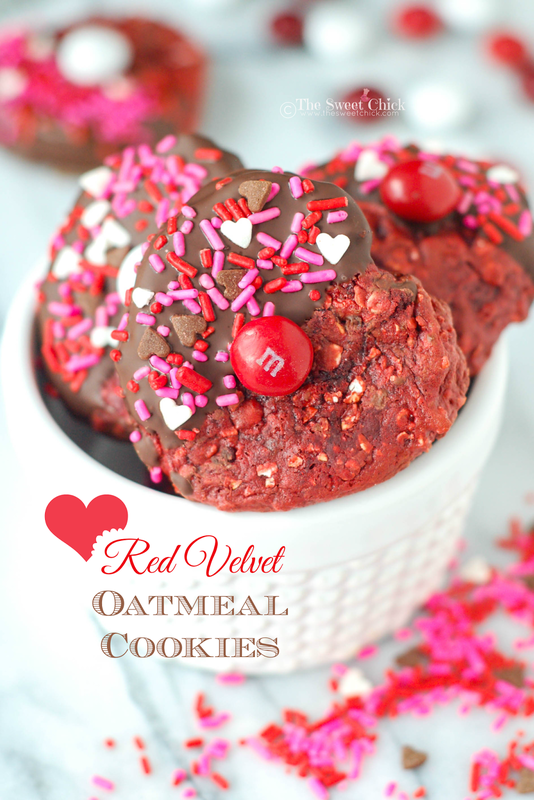 These Red Velvet Oatmeal Cookies are moist and chewy like an oatmeal cookie should be. 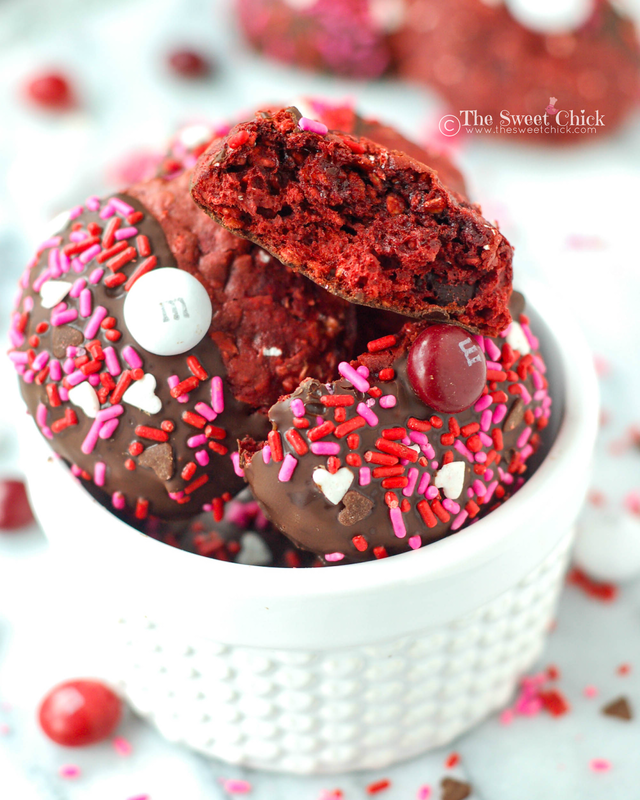 They are filled with plenty of chocolate, banana, and red velvet flavors. You can taste each flavor separately, but they magically all come together smoothly and seamlessly into one incredible flavor sensation for your taste buds. I am trying to save some of these for Valentine's Day on Saturday, but we can't stop eating them. 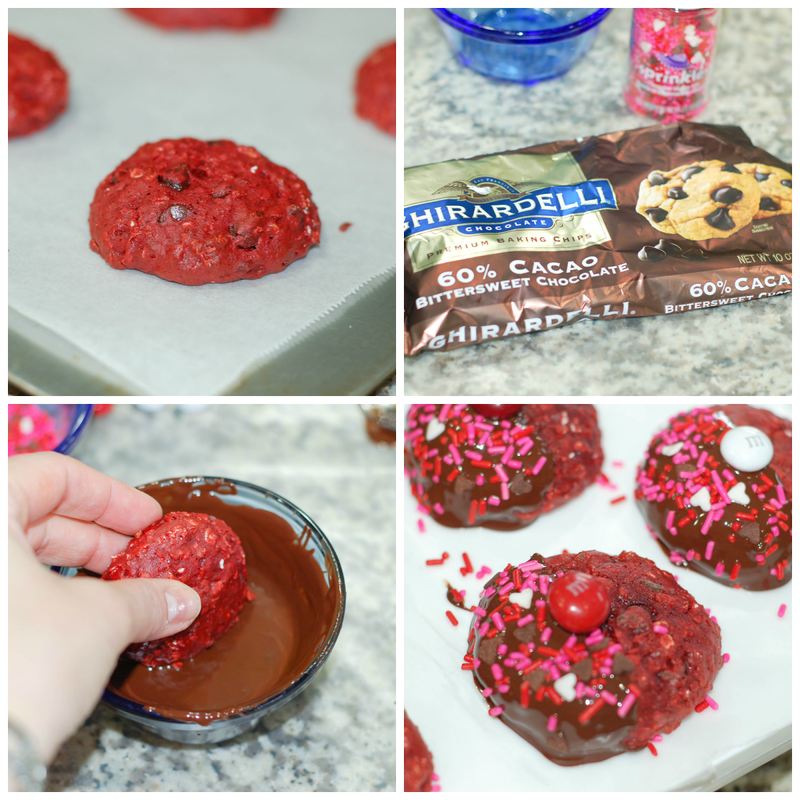 Guess I am going to have to stock up on red velvet cake mixes for future cookie making. 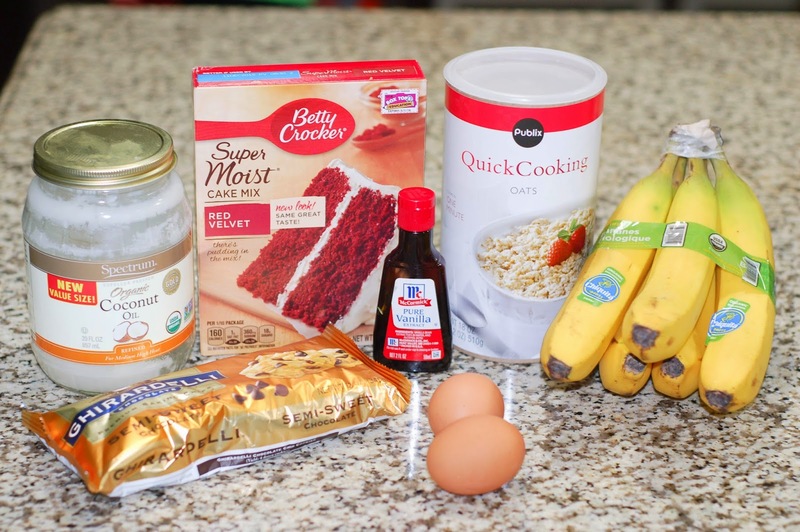 In a stand mixer, mix together the oil, bananas, vanilla and eggs on low speed, until well blended. Add the dry cake mix a little at a time, continuing to mix on low. Scrape down the sides of the bowl as needed. With a regular cookie scoop, drop by scoopful onto a greased or parchment lined cookie sheet at least 2 inches apart. Remove from oven and let cool for 2 minutes on the cookie sheet, then move to a cooling rack to completely cool. Melt chocolate chips according to instructions on the back of the package. Add sprinkles and M&M candies to the chocolate before it completely hardens. I kept my finished cookies in an airtight container at room temperature. If you feel the need to refrigerate yours because you are making them far in advance, I suggest you leave out the M&M's because they lose their color when refrigerated. You can always add them later with a dab of melted chocolate if you wish.